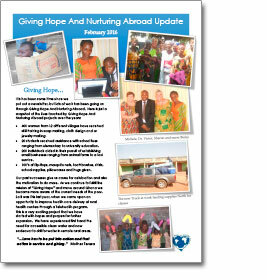 Giving Hope And Nurturing Abroad is a Michigan non-profit corporation organized exclusively for charitable purposes. It is organized for supporting and improving the lives of families and communities abroad by funding activities to serve the needy, addressing desperate health conditions, expanding education and empowering people to become self-reliant. Donations made to the organization benefit individuals, other non-profit organizations and community groups. Mission Statement: We will bring hope and joy to people struggling abroad by providing opportunities for self-reliance through training, education and health care.